In May of 2015, PrecisionHawk was chosen by the FAA to begin research under the Pathfinder program, an initiative to facilitate the early introduction of small Unmanned Aircraft Systems (UAS) low-altitude operations in the National Airspace System (NAS). 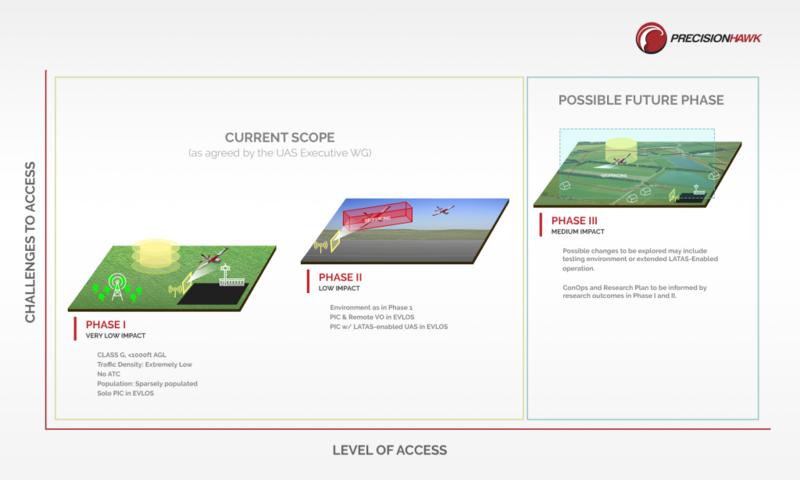 The partnership seeks to demonstrate the safety of extended visual line of sight (EVLOS) operations for drones in rural areas and to better understand how EVLOS flexibility may provide societal benefits through vast commercial applications. Although many applications have been identified that can use data obtained within visual line of sight of the unmanned aircraft, significant market demand already exists for operations that require the UAS to be operated for longer periods of time in an EVLOS environment. Examples of EVLOS dependent uses include monitoring of emergency situations, wildlife census counts and expanded agricultural surveying for improved yield predictions. 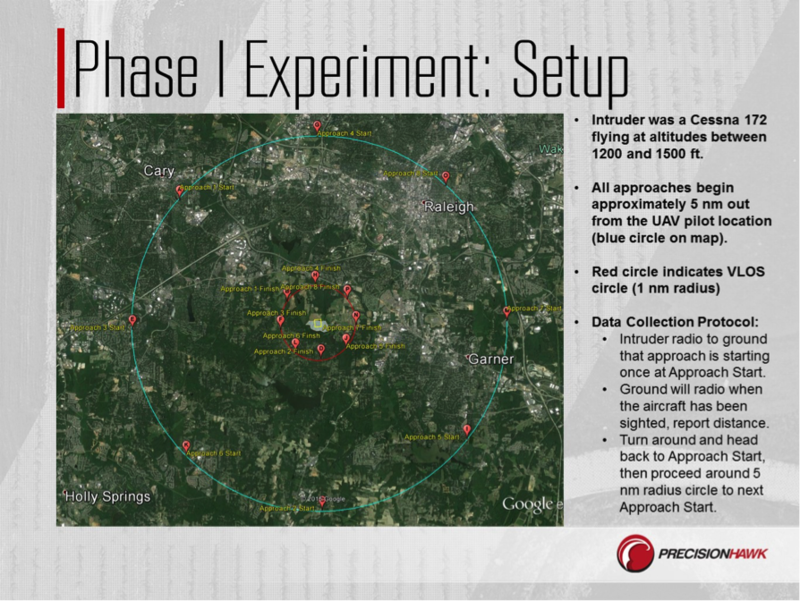 The results of Phase 1, as outlined below, were released by PrecisionHawk as part of the White House Office of Science and Technology Policy (OSTP) Workshop on Drones and the Future of Aviation held in Washington D.C. today. 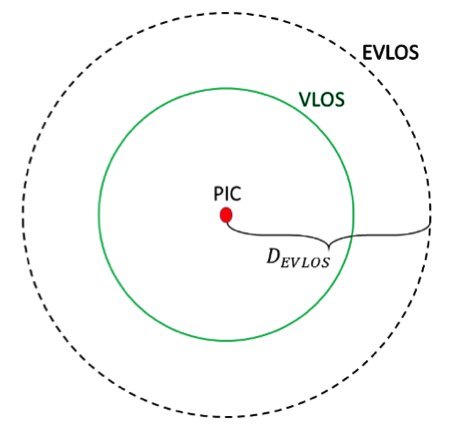 Figure 2: Diagrammatic representation of EVLOS vs. VLOS operation. Team 1: UAS PIC and co-located safety observer (SO). The primary role of the SO is to notify the PIC of an intruding aircraft (either one that is introduced purposefully as part of the experiment or a true, uncontrolled intruder) before the intruder enters the zone where the UAS is operating.  Note the SO is not to give feedback to the PIC upon initial detection of the controlled intruder (as this would compromise the experiment), but should notify the PIC immediately if an uncontrolled intruder enters the airspace. Team 2: Intruder aircraft PIC. Equipped with a LATAS unit or equivalent GPS tracking device so position can be polled at the time the intruder aircraft is detected by the Team 1 PIC. Test administrator: Signals intruder aircraft to enter operational range of test. Records results. Administers situational awareness questionnaires to both PIC and safety observer. The following test results were performed in early December 2015 at Lake Wheeler, North Carolina. Experimental setup and data collection protocol at the Lake Wheeler location is shown in Figure 3. Visual Angle = Low or Mid-Low: i.e. visual angle of obstructions < 5 deg. Even within the limited uses and restrictions of commercial visual line of sight (VLOS) operations permitted to date, UAS are proving beneficial to numerous industries by providing insights previously unattainable from other means of remote sensing. This is due to the high spatial and temporal resolution of the UAS, allowing for the rapid and cost-effective capture of essential decision-support data. Currently, the majority of the day-to-day operational cost of the UAS, beyond the initial capital investment in the system itself, is due to the cost of placing the PIC at an appropriate location to fly. EVLOS operations allow a given operator to obtain more data from the same location, increasing return on investment with every operation. Without the ability to fly EVLOS, many companies nationwide will not be able to attain a substantial percentage of the available remote sensing value from the UAS. As explorations into EVLOS deepen, it is worth briefly exploring how the public stands to benefit from such flexibility of commercial drone operations. UAS is proving itself to be a critical tool in the advancement of precision agriculture in the United States. Currently staying within the bounds of visual line of sight, farmers can only cover hundreds of acres in a flight, making it impossible to scale to large farming operations. Flying EVLOS will be a critical need to cover the thousands of acres that farmers operate their agricultural businesses. By enabling EVLOS operations in agriculture, the industry can help work toward achieving food security for the growing planet. With UAS, researchers and companies can monitor wildlife in a much easier way than previously capable. These industries include researchers, oil & gas companies, utilities, etc. In many cases the wildlife is spread across a very broad area (a few square miles in some cases). It is nearly impossible to monitor large numbers of wildlife if trying to operate within visual line of sight; this can even prove dangerous for the surveyor to be that close to certain wildlife. Additionally, there are substantial safety advantages to UAS for wildlife monitoring. As a specific example, of the 91 deaths recorded for wildlife biologists who perished while engaging in work-related activities between 1937 and 2000, 66% were related to aviation accidents. Most fatal flights were conducted for the purpose of wildlife or wildlife-habitat observation (50%) and radiotelemetry (26%). EVLOS operations have significant potential to replace the need for data collection of this type from manned aircraft. In some instances (e.g. disaster assessment) it is simply not possible to place an operator safely in sufficient proximity to ensure VLOS is maintained. In a number of these applications, satellite data has neither adequate spatial resolution nor sufficient timeliness to be useful to emergency teams and the safety risk inherent in attempting to collect data from manned aircraft is too great. UAS operations provide a solution to gathering the necessary data to inform response terms provided EVLOS operations are permitted. 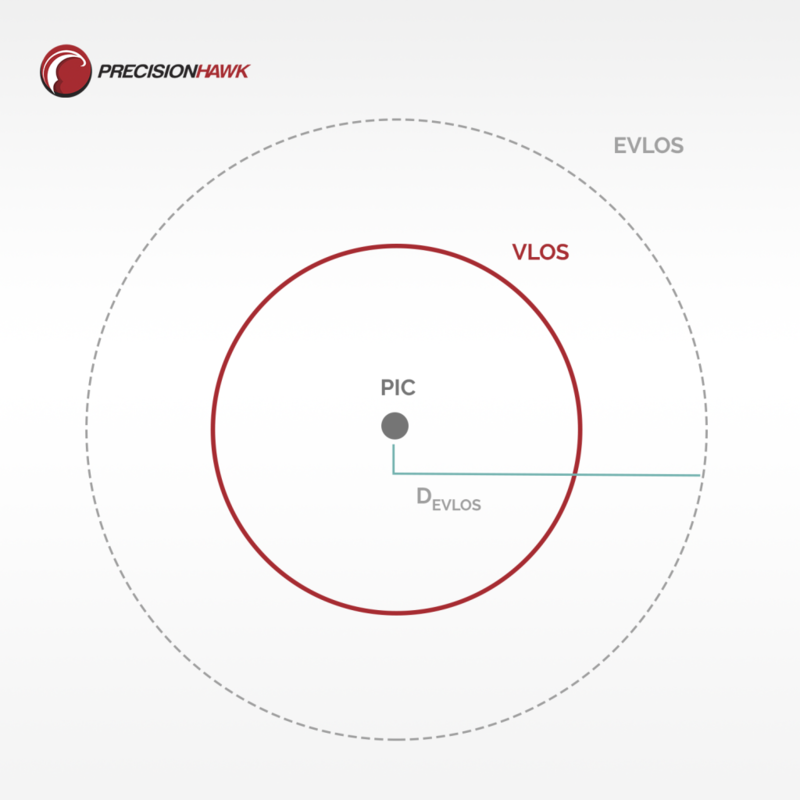 Through Phase I of the Pathfinder program, PrecisionHawk has researched and uncovered a working definition for operational EVLOS, an initial measure distance that can be used immediately to continue Pathfinder research efforts. 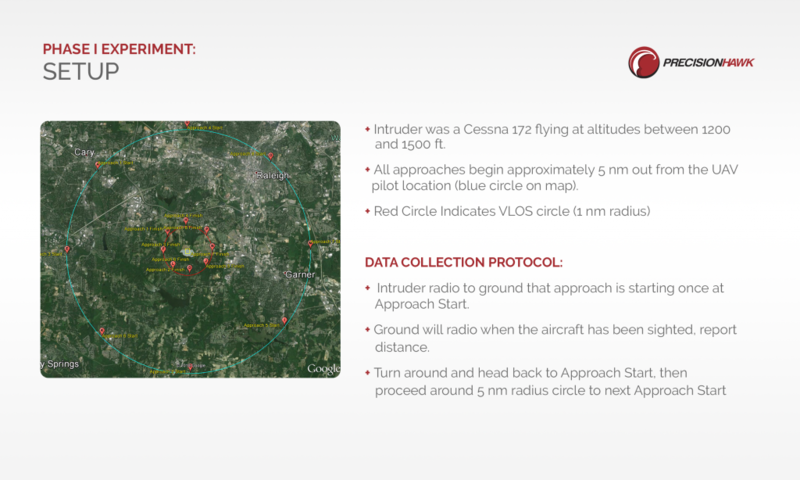 In Phase II, a series of controlled field experiments are planned to assess a number of metrics relevant for calculating the achievable level of safety, including PIC response time and choice of action when confronted by a manned intruder. Measurements will be taken over a wide variety of environmental conditions on populations of certified pilots at varying levels of field experience and non-certified individuals to help shed light on the crucial factors influencing risk in the proposed operations. The final results, generalizable to multiple classes of small UAS, will provide a necessary dataset for both regulators and industry stakeholders to ensure continued safety of operations in the NAS. Check out a behind-the-scenes look at our Phase 1 tests!